Fate intervened. Had I not been compelled to move the tupperware container sitting on a shelf in the fridge, I would not have spied the sad looking plastic bag behind it. But I did move it! I did! And since then, our breakfasts have taken a delicious turn. The lucky find was cilantro, an herb that was used days before and then quickly forgotten. So that morning, I made eggs over easy with toast, some spices/herbs, and then a generous dusting of cilantro. It was good, but we decided that the sourdough bread needed to be bronzed on a skillet in order to be easier to eat (plus, you know, more fat and deliciousness). So the next day we did the bronzing with the same herbs and spices and the cilantro. Then I wondered what would happen with a drizzle of lime juice, so the next day, we did the bronzing, the herbs and spices, cilantro... and the lime juice. Harmony. Seriously, what an unexpectedly awesome combination. I can't bear to think what would have happened had I not moved that container when I did. Instead of a wonderful new breakfast, a slimy green mess would have been found... then tossed. Heat olive oil in cast iron skillet. Place the slices of sourdough bread on the griddle and bronze each side. Take off heat once both sides have browned. Set aside. Pour in more olive oil if needed. Crack the eggs into the hot skillet. Sprinkle with oregano, salt, pepper, cumin, and garlic powder. Once the white looks pretty cooked (about a minute), get the spatula (be sure to get it underneath the yolk) and flip the whole thing to finish cooking (over easy). It should only take a few seconds. Then place on bronzed toast. Cover with a healthy sprinkling of cilantro. Serve with lime wedges. Wonderful, simple, flavourful meal. I'm very hungry now! Simple, tasty breakfast. The lime is a great addition. best flavors ever imho :) great twist on a simple meal! Mmmm love cilantro and lime together. Such great flavors! Wow, love your cilantro toast! Cilantro is my most favourite fresh herb plant. I have a pot of cilantro growing outside my kitchen window! Now that looks like a great breakfast! If I could have any breakfast right now, THIS would be it! Lovely breakfast! I love fresh cilantro. It has so much flavor. 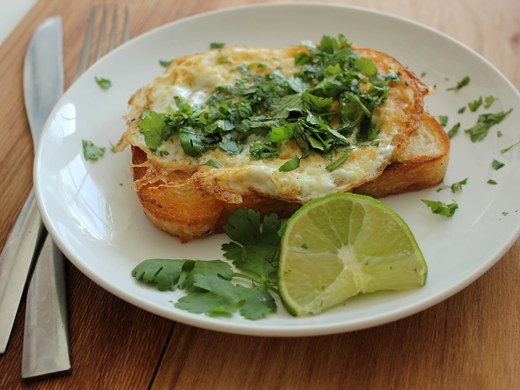 Cilantro and Lime and two of my favorite ingredients.Those eggs look amazing! I usually make cilantro scrambled eggs and they are fantastic....I love your addition of lime....Will try it next time! I just love finding stuff in my fridge that I forgot were there. Even better when you realize it is still good! This is the story of mu life. I always find things i have forgotten about them. This dish is perfect for a strong, good start! You've done it again! Taken simple ingredients and created a dish worthy of a king! Love coriander, as we call it this side of the pond, and always a winner with lime. I love that you combined it with sourdough bread, yum! It is an unexpected combination of ingredients, but how nice to spice up the typical fried egg! This sounds amazing! I always loved fried egg on toast before I was vegan, and I love the pops of flavor here! I would be tempted to add avocado too :)! I love all of these ingredients. I can't believe I haven't thought to combine them for breakfast... but now you shared the recipe, so I can do it tomorrow! Fixed this up this morning. Lovely!!!! Great new twist for breakfast. Thanks! Made this again for dinner... needed to use up the cilantro... and, initially forgot the lime juice. Woah! Not the same at ALL without the lime juice!!! Thanks again for the yummy dish! Oh I love this :) I'm a sucker for a fried egg but never thought to do a cilantro/lime twist. This is what i call perfect breakfast! You give me nice idea to make some change in my breakfast type. Nice!